Planar® Mosaic® Architectural Video Walls redefine interior spaces, providing endless possibilities for creative expression and offering a dynamic way to deliver art and information. 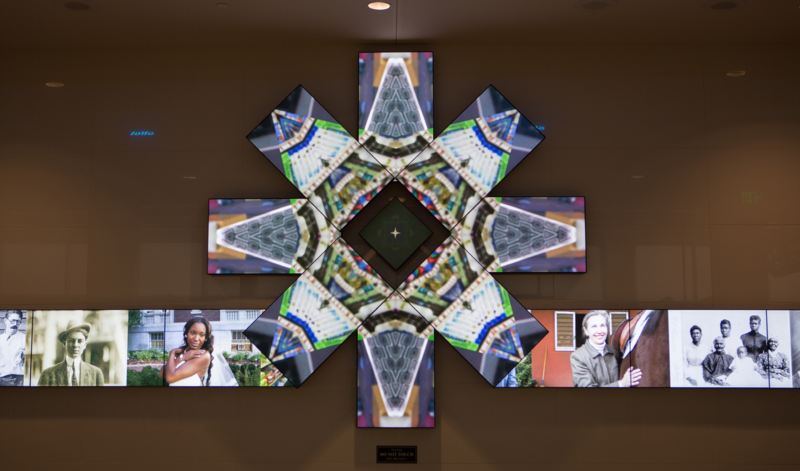 Planar Mosaic video walls can create desired emotions or build brand experiences in any space. Planar Mosaic features three different sizes of LCD video wall tiles, including a truly square 22″-diagonal LCD video tile. Planar Mosaic video wall tiles can be mounted in any position relative to each other, and individually at almost any angle. With unencumbered position flexibility, off- board power supplies and sophisticated Planar Mosaic Project DesignerTM software, Planar Mosaic sets the standard for architectural video walls. Planar Mosaic was developed by video wall industry experts to allow architects, interior designers, and A/V integrators to create unique video walls for their clients that are memorable, impactful and timeless. Cabling is easy with daisy-chained power and content. Each Planar Mosaic DisplayPort daisy-chain can accept up to 4K resolution (3840×2160). A tile group can also be programmed with a custom EDID if its shape represents a non-standard aspect ratio. This allows flexibility to optimize the video wall for the overall size of the video wall, the distance from which it is viewed and the resolution of the source content. Planar Mosaic video walls offer unique design elements that simplify installation, service and content planning. In addition to supporting any tile rotation or pitch, the Mosaic Mount features push-in/push-out snap catches and auto-alignment posts, eliminating the need for fine-tuning. Planar Mosaic video wall tiles can be placed into Service Mode allowing for easy front-servicing of the tiles. Off- board power supplies are rack-mounted in a remote location, which removes heat and points of failure from the video wall tiles. Many types of sources can be used to deliver content to a Planar Mosaic video wall including a media player, PC or MAC, video wall processor or digital signage system. Content can include stock images or video, or be purpose-built for a specific Planar Mosaic array. A transparent PNG mask file can be exported from the Planar Mosaic Project Designer software, allowing content developers to create content that plays off the unique shape of a Planar Mosaic video wall. Many video wall users want a single video scaled across the entire Planar Mosaic array, and occasionally have individual sources appear on individual Planar Mosaic tiles. This can be achieved multiple ways. For details and recommendations, download the Planar Mosaic Content Guide on www.planar.com/mosaic.